This name, with variant spellings Dawtr(e)y, Daught(e)ry, Daltr(e)y, Dealtry, Doughtery, Dowtry, and Ha(w)tr(e)y, is of Norman locational origin from Hauterive in Orne, so called from the Olde French "haute rive", meaning a high bank, the ultimate origin being the Latin "alta ripa". The surname from this source is first recorded in the latter half of the 12th Century, (see below). One, Robert de Halterida and a Philip de Hauteriue appear in "Documents of the Danelaw" circa 1155. The spellings Dautry and Dawtre are recorded in the 1379 "Poll Tax Returns of Yorkshire". These forms result from the fusion of the preposition "de" with the name. 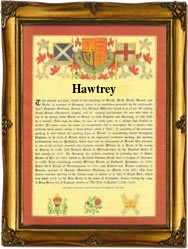 A Robert Hawtry appears in the 1524 "Subsidy Rolls of Suffolk" and George Daltry or Dealtry in the 1671 "Freemen of the City of York". On August 10th 1690 Elizabeth Daltry was christened in St. Mary Magdalene, London. The first recorded spelling of the family name is shown to be that of William de Alta ripa, which was dated 1166, in the "The Pipe Rolls of Yorkshire", during the reign of King Henry 11, known as "The Builder of Churches", 1154 - 1189. Surnames became necessary when governments introduced personal taxation. In England this was known as Poll Tax. Throughout the centuries, surnames in every country have continued to "develop" often leading to astonishing variants of the original spelling.